General Electric introduced its Evolution series (“G.E. 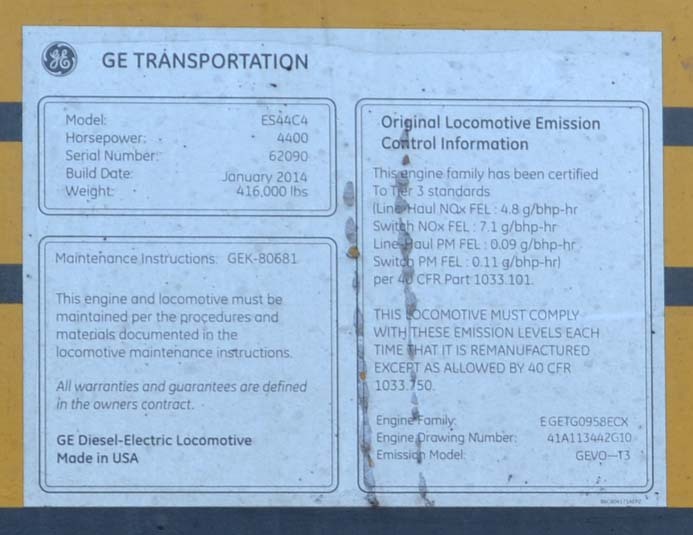 Evolution” ⇒ GEVO) of locomotives to comply with the ever-more-stringent EPA emissions standards. The initial models (e.g. 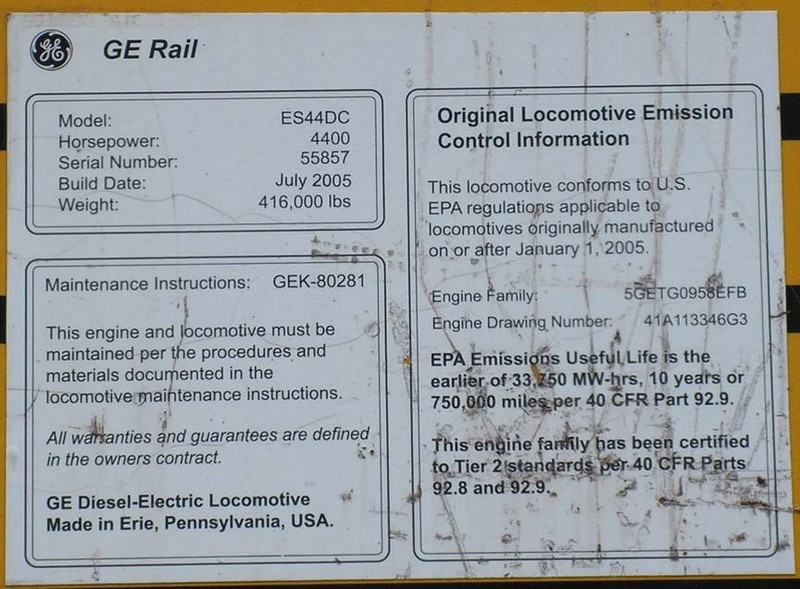 ES44DC) were Tier 2 compliant, coming out around 2005. 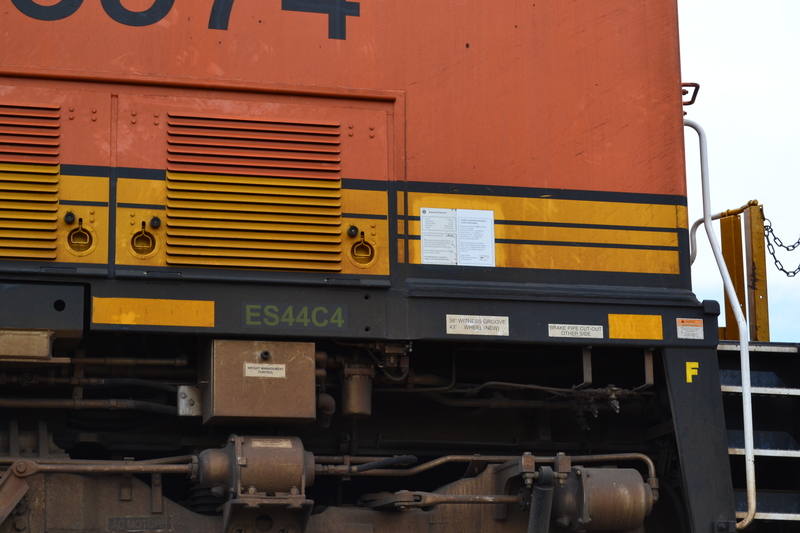 The latest versions, the ET44AC and C4, are Tier 4 compliant. 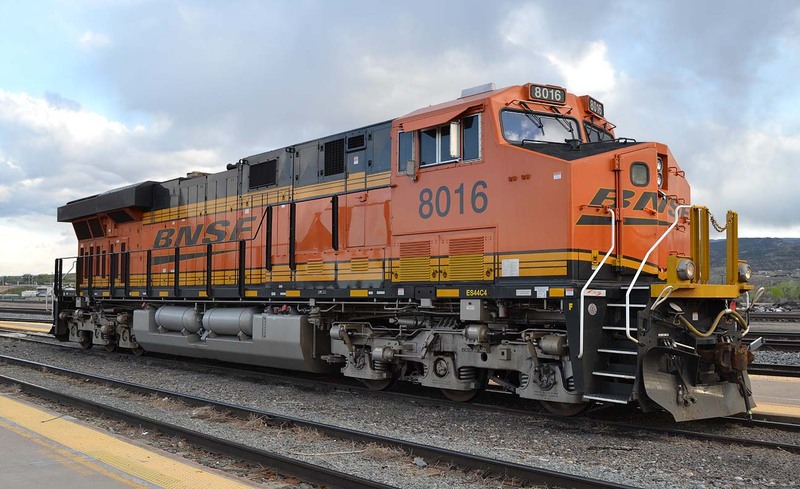 BNSF has purchased thousands of the emissions-friendly GEVO series, in several different models– both DC and AC traction, and the interesting ES44C4 and ET44C4 versions with only four powered axles in an A-1-A A-1-A arrangement. 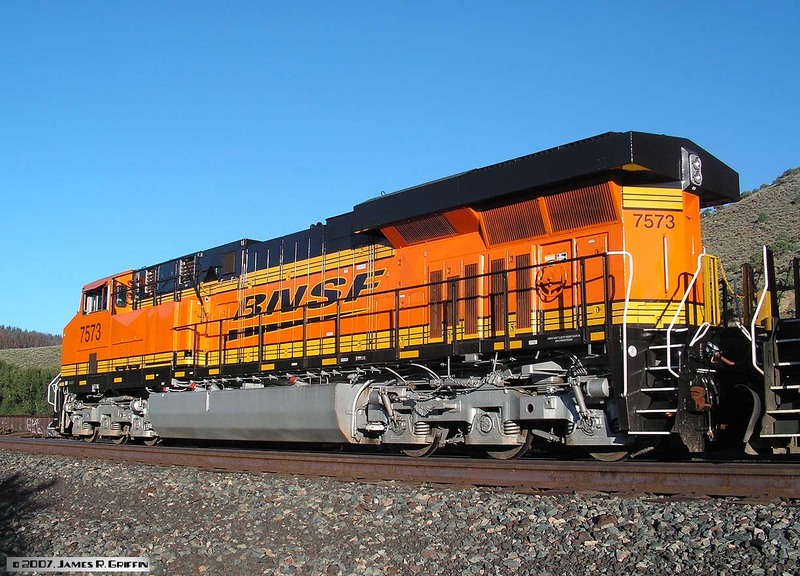 This page has a sampling of roster photos of the various GEVO types that BNSF has owned. Two views (both sides) of No. 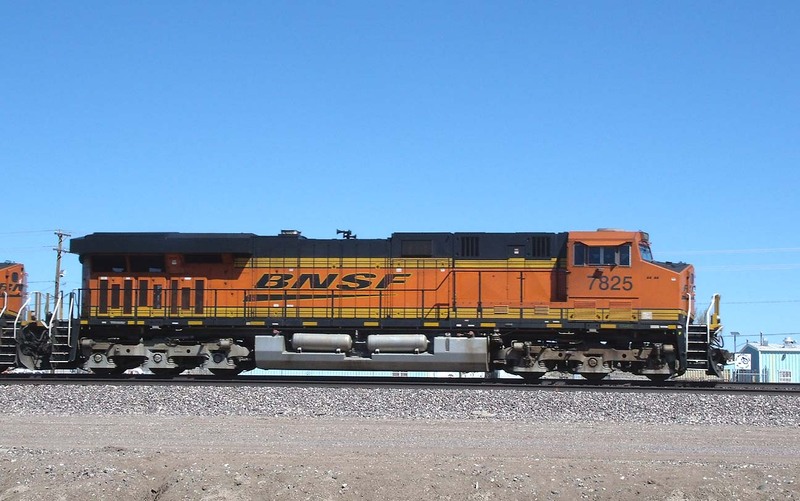 7274 near Perea, NM on 9/11/2010. It’s third, trailing unit, on a westbound stack/rack train. No. 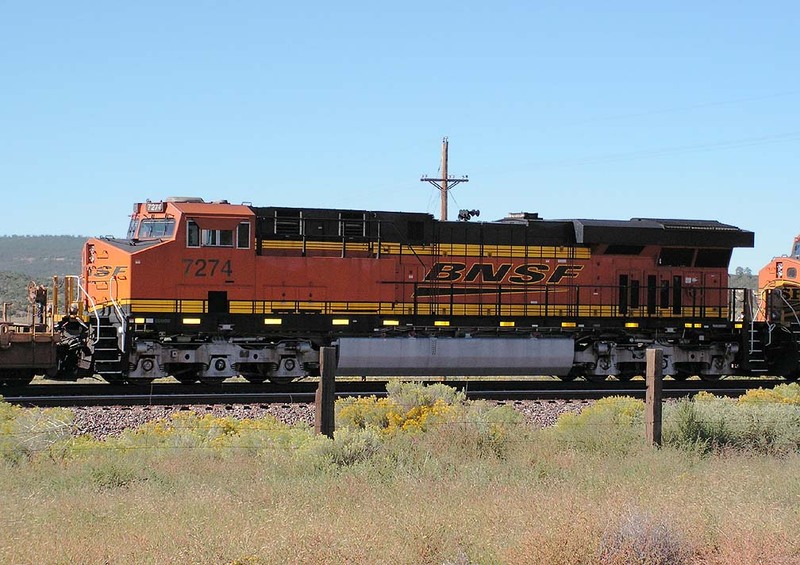 7277 is stopped at West Gallup, with an eastbound freight, on 9/24/2011. No. 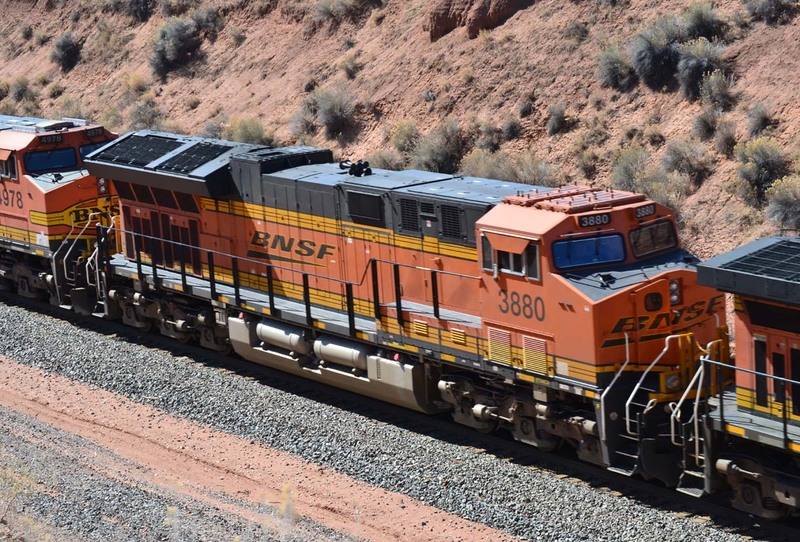 7283 is westbound, west of Gallup on 9/11/2010. No. 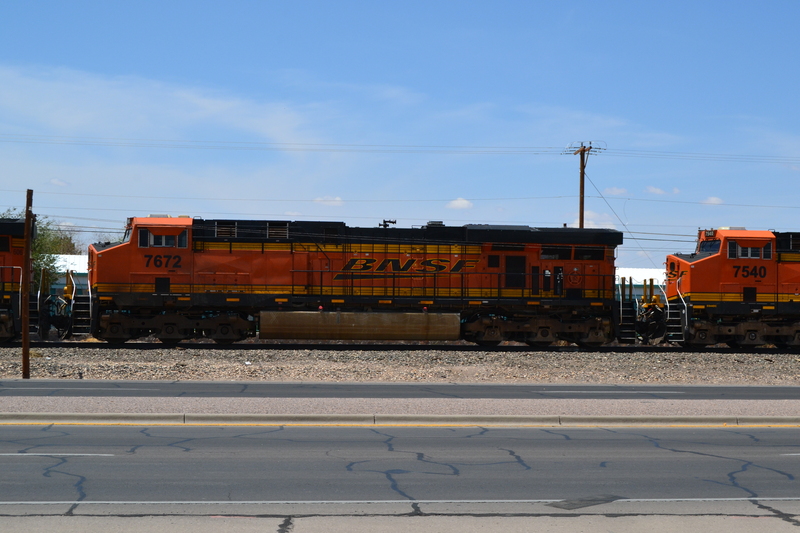 7335, northbound in Las Cruces on 7/30/2016. No. 7337 is eastbound near Perea, NM on 9/11/2010. Here it’s actually stopped, waiting for Amtrak train No. 4 to clear. No. 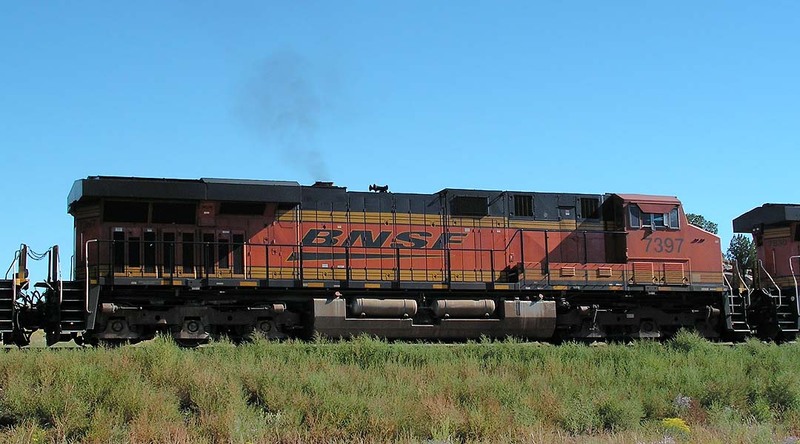 7363 is eastbound near Perea, NM on 9/11/2010. Same train as No. 7337 above. The ES44’s are becoming dominant on the Transcon. No. 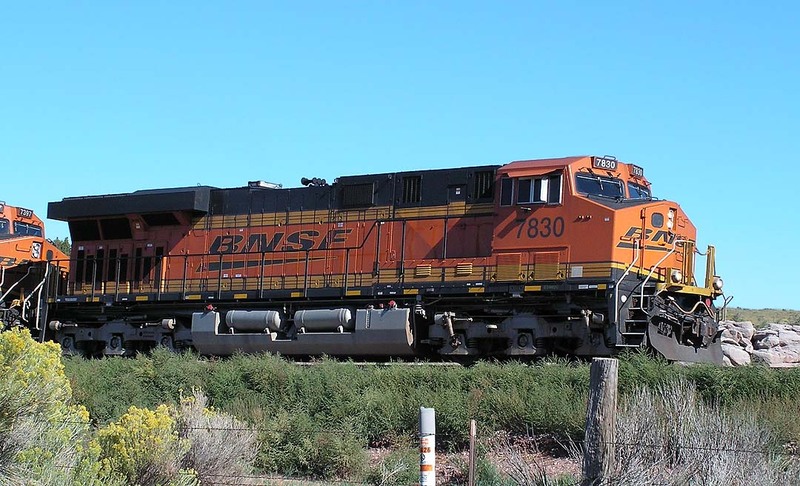 7390 is eastbound west of Gallup, NM on 9/11/2010. 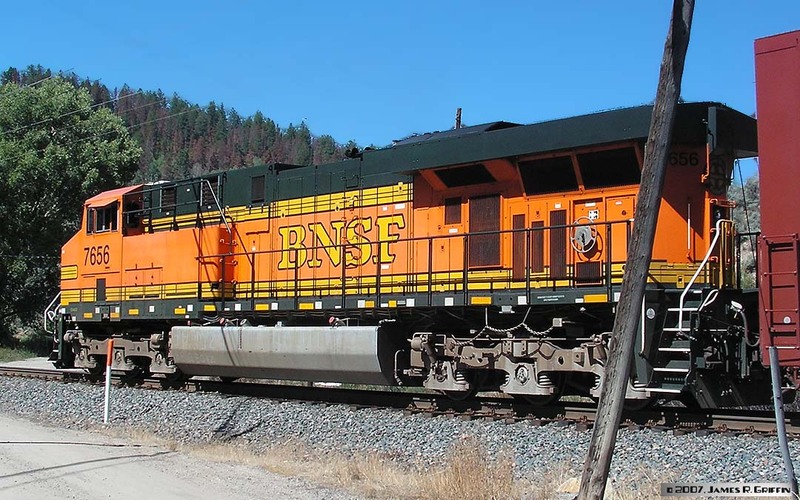 It’s the rearmost DPU unit on a stack train. No. 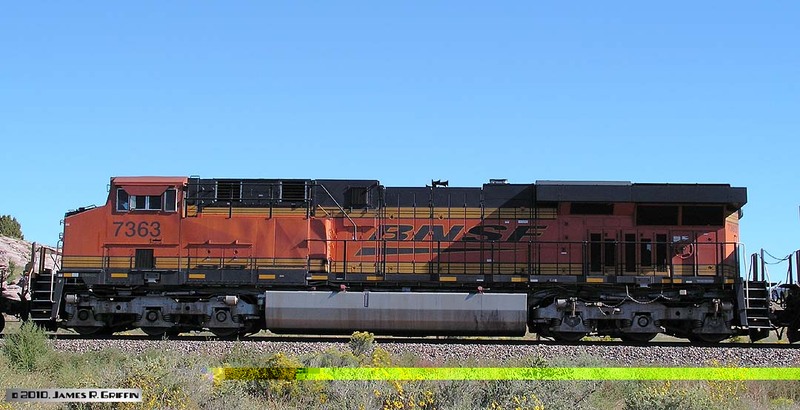 7397 is on an eastbound intermodal near Perea, NM on 9/11/2010. Here it’s actually stopped, waiting for Amtrak train No. 4 to clear. No. 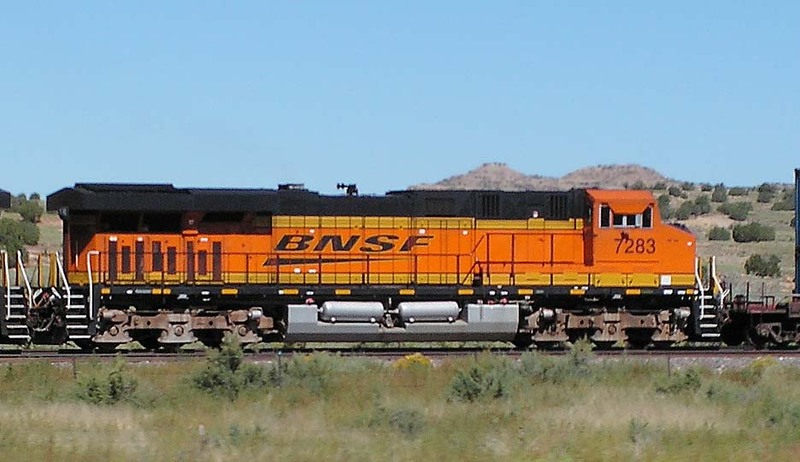 7469 is leading an eastbound freight at Gallup, NM on 9/11/2010. Four views of No. 7479 at Rincon, 9/07/2009. Note the ladder access to the roof from the top of the walkway box on the conductor’s side. There are at least two variations of these units and the ladders are located differently on each. No. 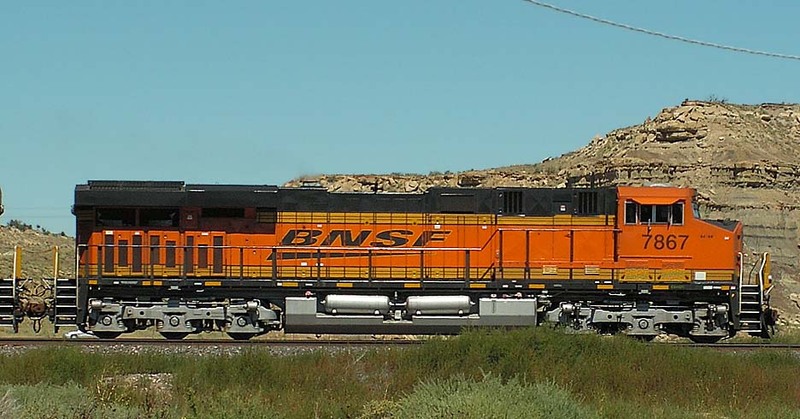 7503 is spotted on the service track at Gallup, NM on 9/11/2010. No. 7573 at Sulphur, CO on 8/09/2007. This unit was built in June 2007, so it’s less than three months old here. No. 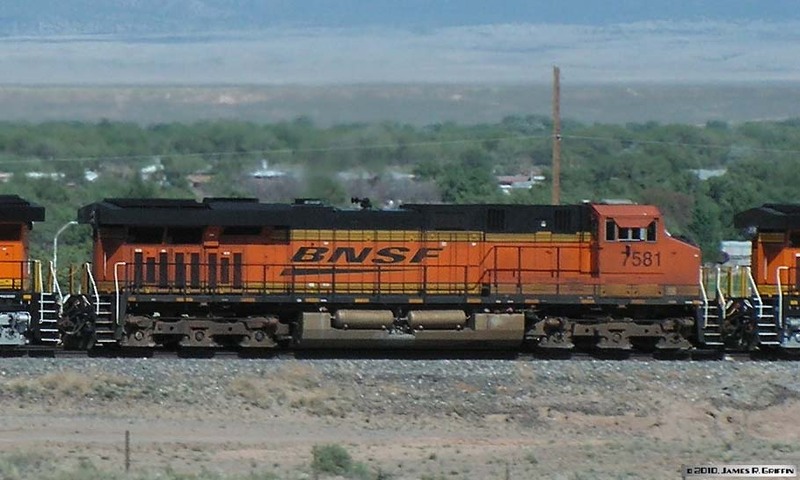 7581, leaving Belen, NM with a stack train on 5/09/2010. 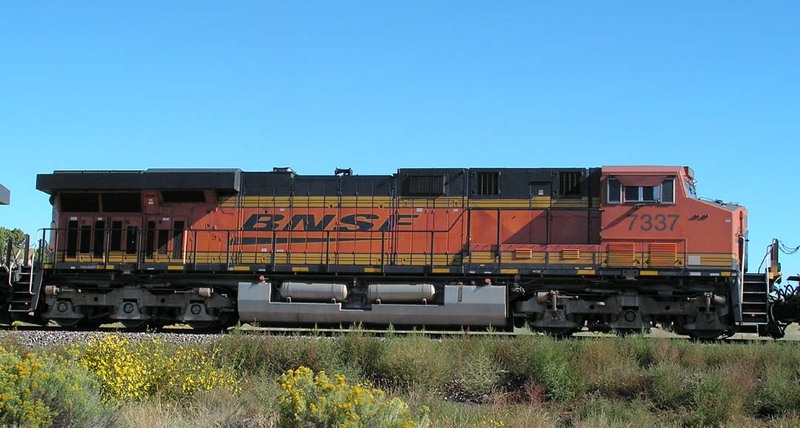 This is one of the dirtier BNSF units I’ve photographed. No. 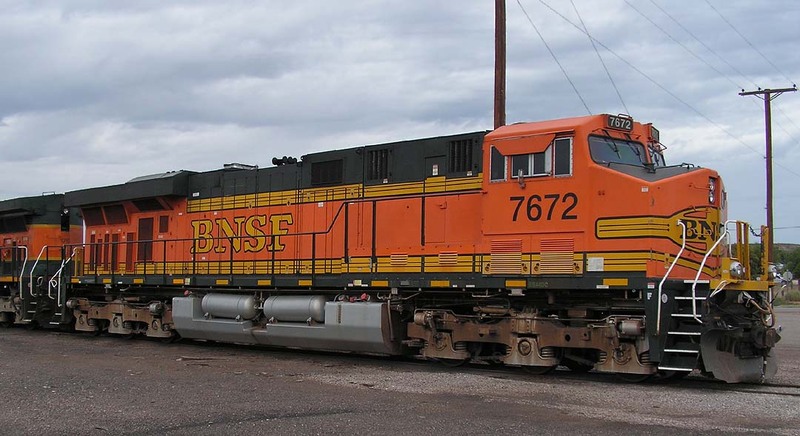 7584, parked in Grand Junction on 4/26/2014.Built June 2007, it’s about 7 years old in this image and shows some road grime. No. 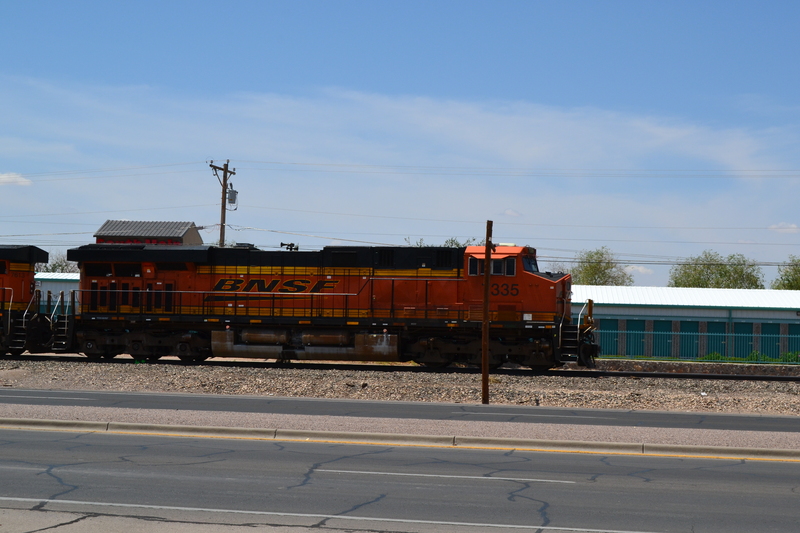 7613, northbound through Las Cruces on 7/31/2016. Built October 2005, one of the first series in New Image. No. 7656 at Sulphur, CO on 8/09/2007. 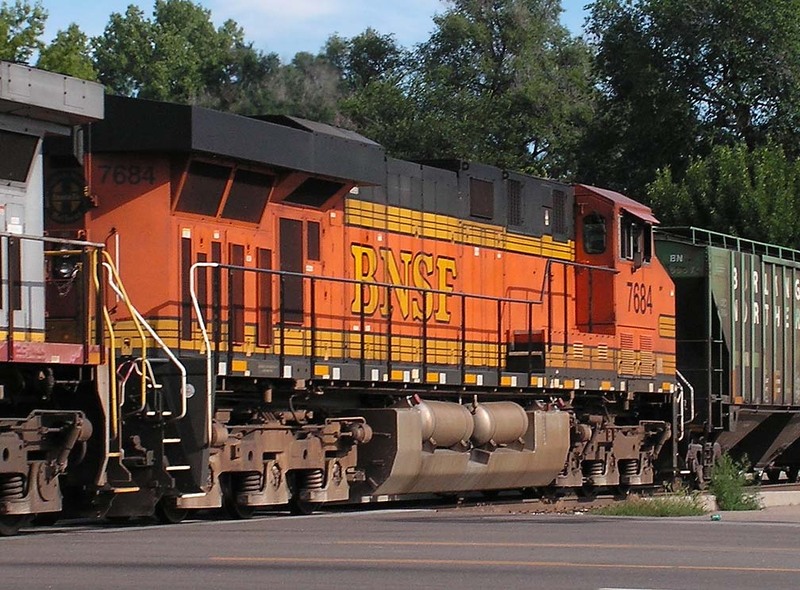 It was delivered in January 2005, and thus barely missed being painted in the Wedge scheme. It has ladders on the end of the long hood, on the middle left, and also forward behind the cab. This also is a good look at the modified radiator setup. No. 7672. Top: at Rincon, NM on 7/11//2010. Built in January 2005, it’s slightly faded, though not as bad as some of these units. 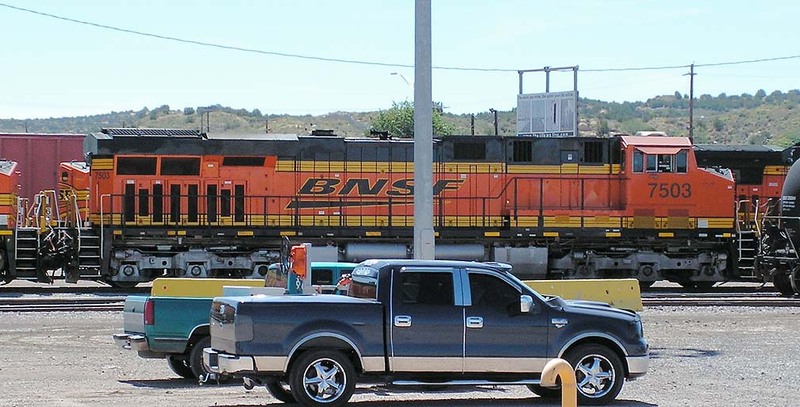 Bottom: at Las Cruces on 7/31/2016, and it’s been repainted into the New Image scheme now. Here is the builder’s plate. No. 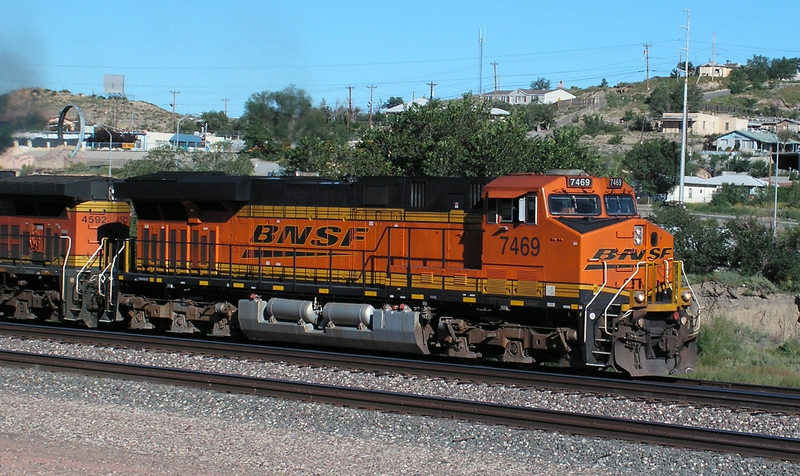 7678 at Rincon, NM on 11/04/2007. No. 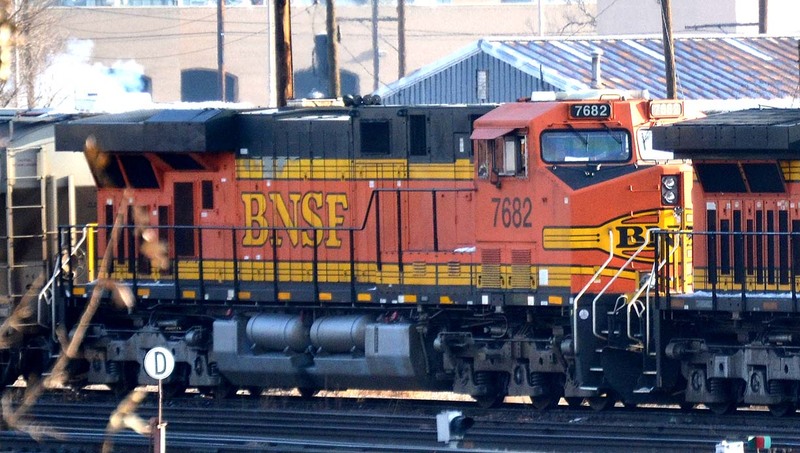 7682 at Denver, 12/18/2014. In H2 paint. No. 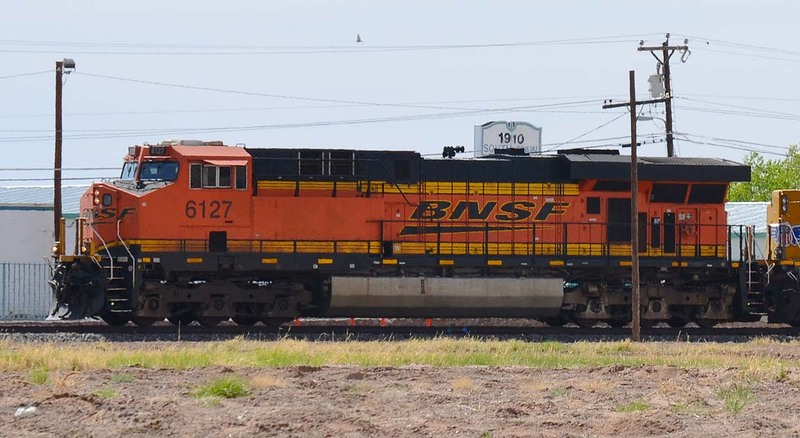 7684 is the trailing unit (of three) on a southbound freight at Longmont on 7/31/2010. Note the H2 paint scheme. Built February 2005. Note that the engineer’s side of these units has no ladders. No. 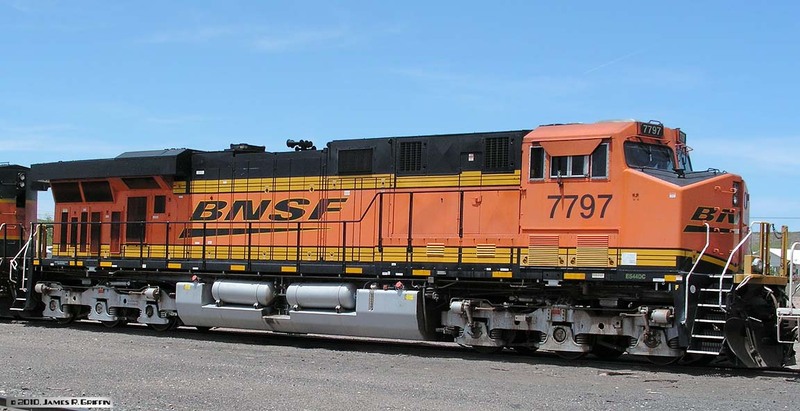 7797 at Rincon, NM on 5/09//2010. Built in July 2005, it’s already fading to a salmon hue. No. 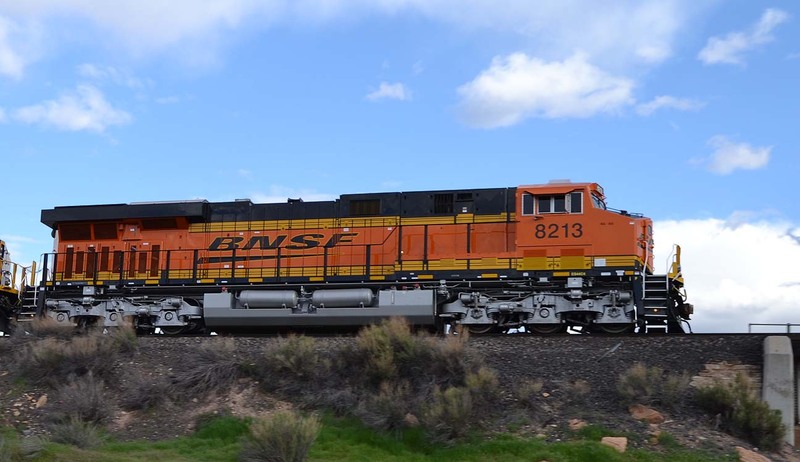 7825 leads an eastbound stack train into Gallup on 4/22/2012, 11:00 AM. This must have been a very light train, with only two units total for power. 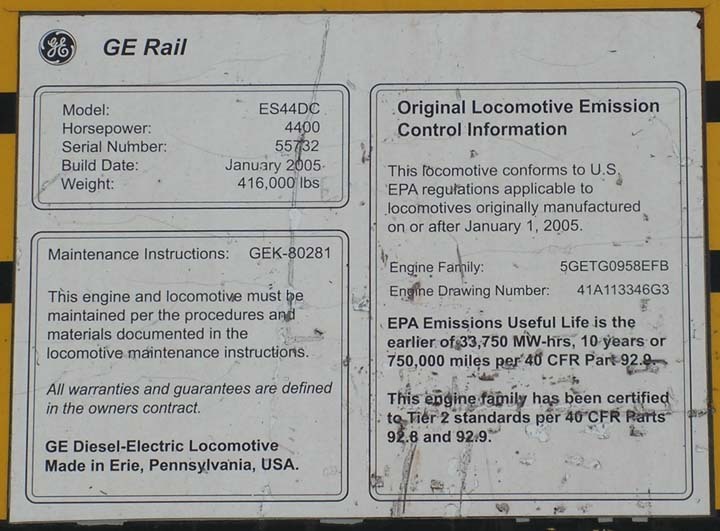 Built in March 2010; this number displaces an SD40-2 on the roster. No. 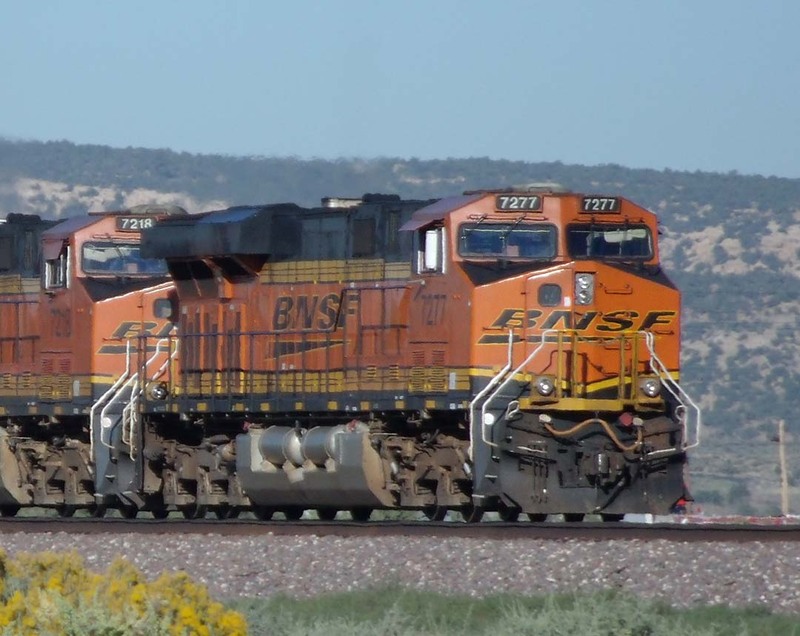 7830 leads an eastbound stack/pig train near Perea, NM on 9/11/2010. Here it’s actually stopped, waiting for Amtrak train No. 4 to clear. Built in March 2010. No. 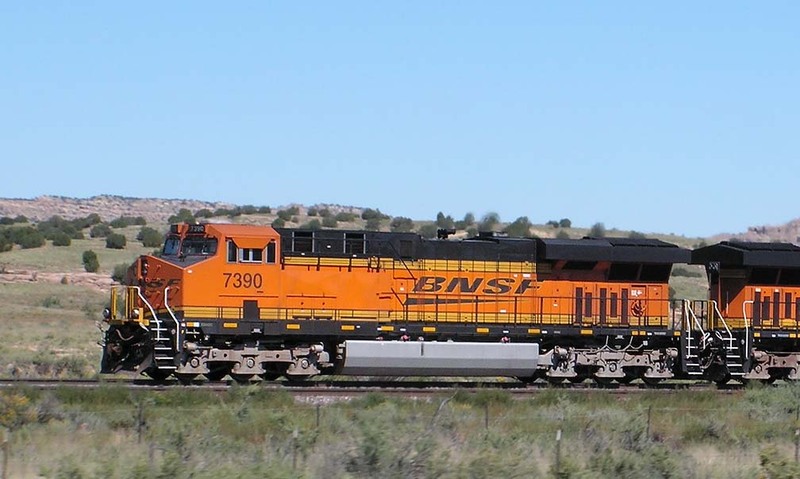 7836, leaving Belen, NM with a stack train on 5/09/2010. Built in March 2010, it’s certainly clean-looking at the 2-month mark. No. 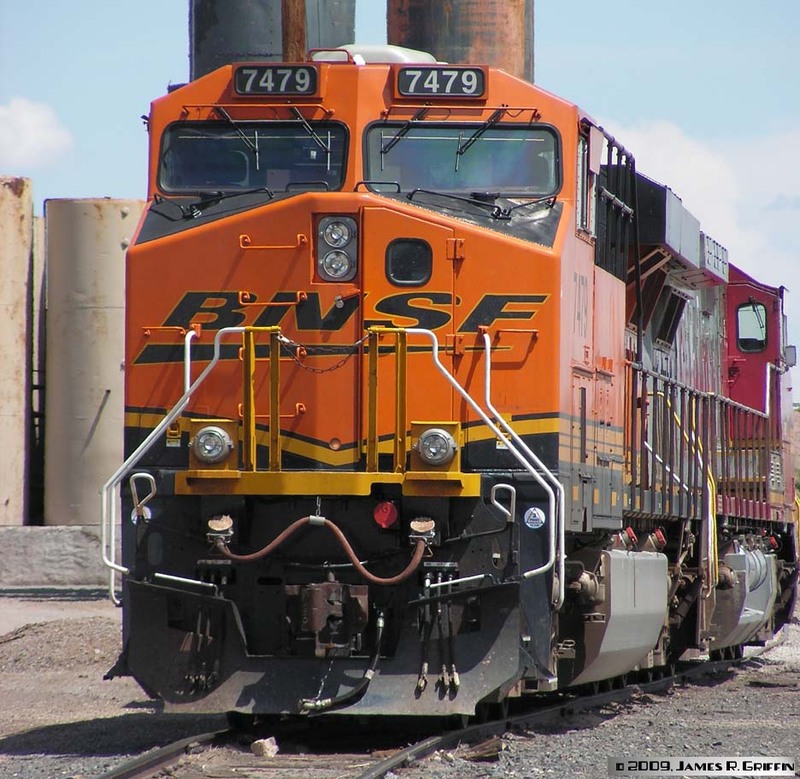 7867 leads an eastbound stack train into Gallup, NM on 9/11/2010. Built May 2010, so it’s nearly brand-new in this photo. No. 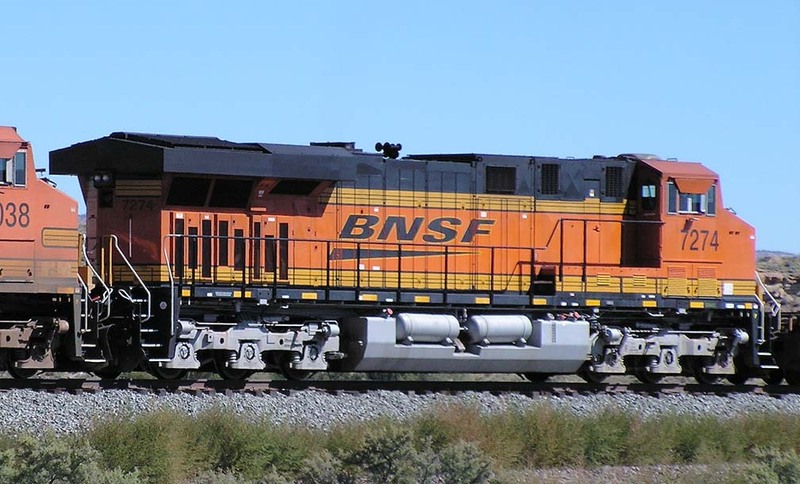 7893 is the trailing unit (of the head end group) on an eastbound stack train coming into Gallup, NM on 9/11/2010. Built July 2010 and is only two months old here. It looks like it too! ES44AC No. 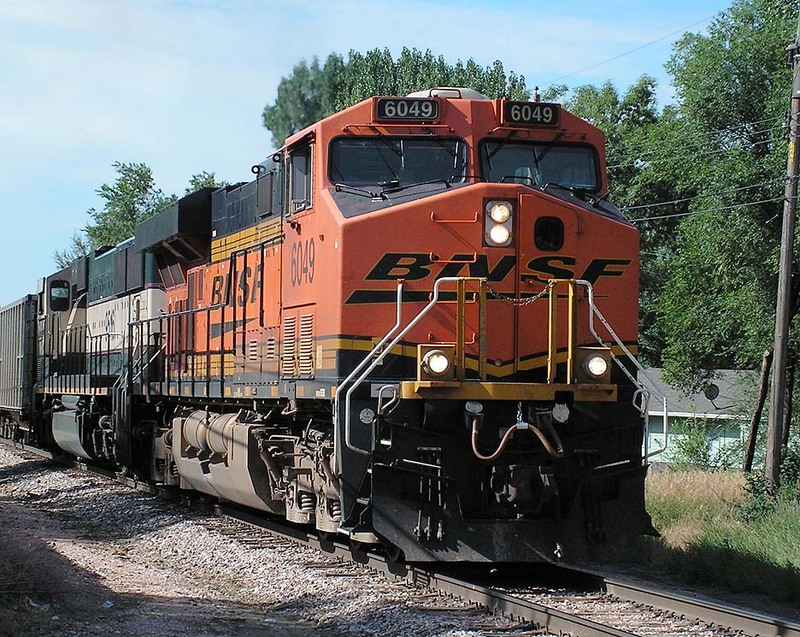 6049 leads a northbound coal empty through Longmont on 8/01/2010. 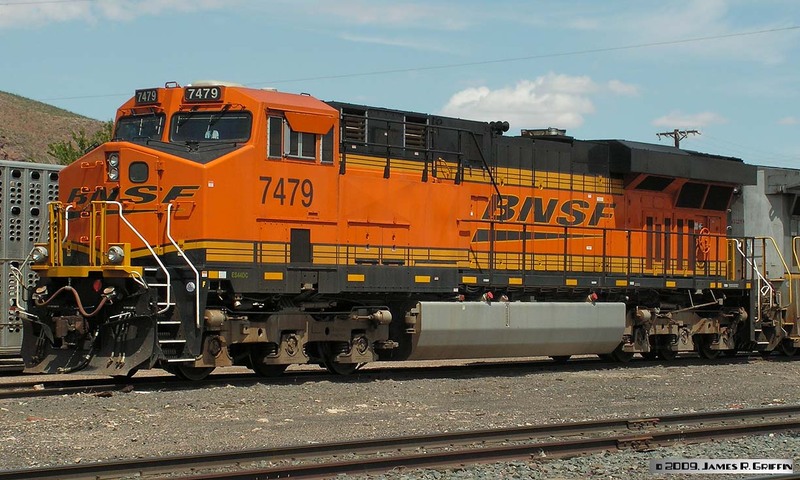 I don’t see many of these in my normal haunts, but they are a numerous class on the BNSF nonetheless. ES44AC No. 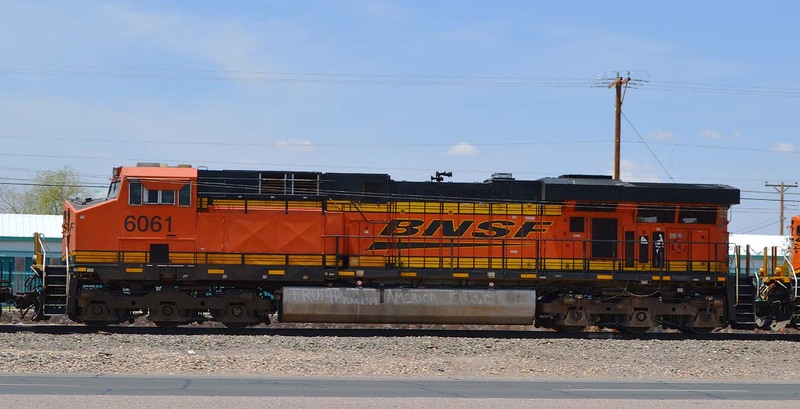 6061 rolls through Las Cruces on 7/31/2016. ES44AC No. 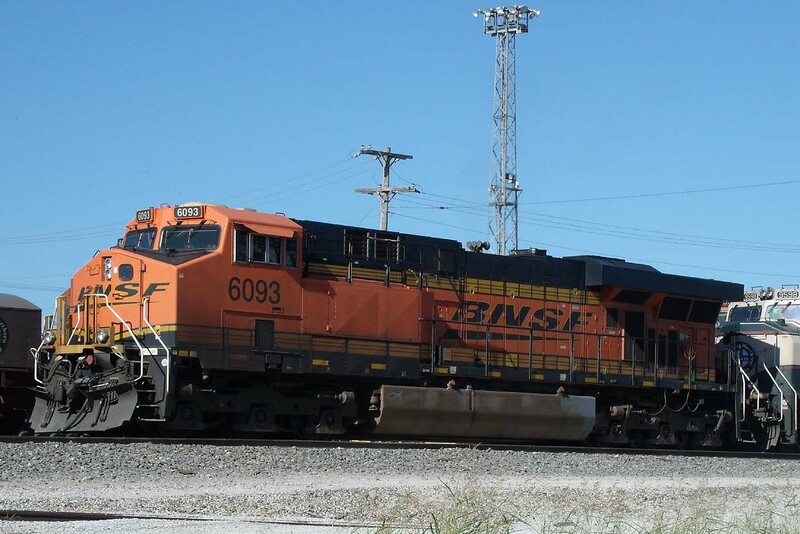 6093 on the point of a westbound loaded coal train parked in Springfield, MO on 9/03/2013. 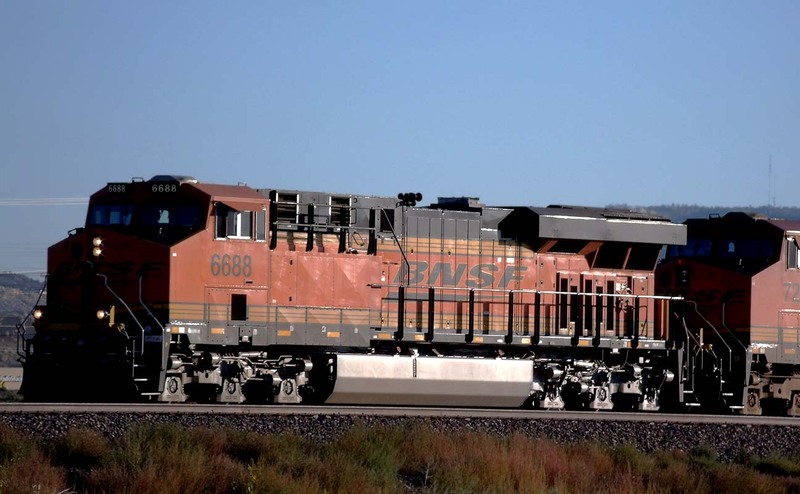 It led a pair of SD70MAC’s in the Executive scheme. This image gives us a a good look at the AC cabinets behind the cab. ES44AC No. 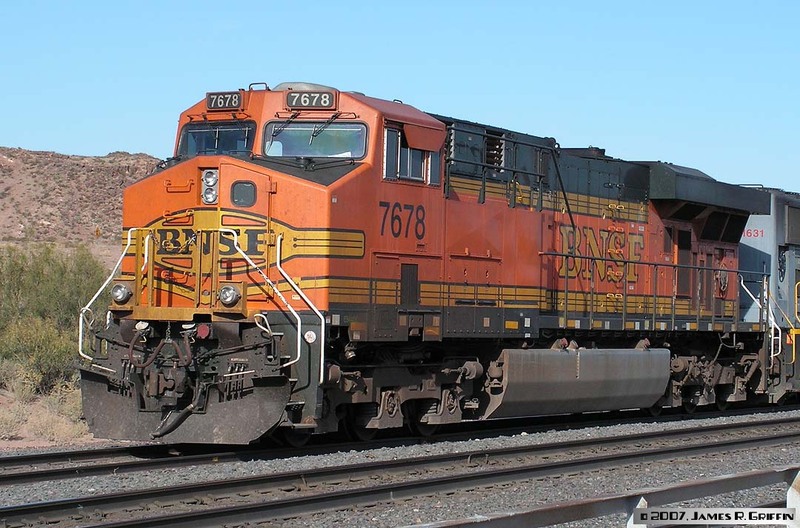 6127 leads a southbound autorack train through Las Cruces on 4/05/2015. No. 6209 at Denver, 7/29/2007. Built February 2007, so it’s about 5 months old in this photo. ES44C4 No. 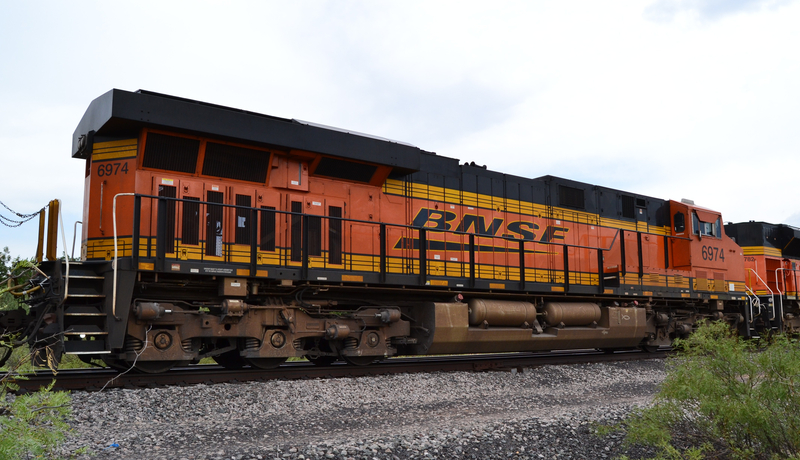 6548 leads an eastbound trackage-rights train at Palisade, Colorado on 4/28/2014.Possibly built circa April 2013 but need confirmation. ES44C4 No. 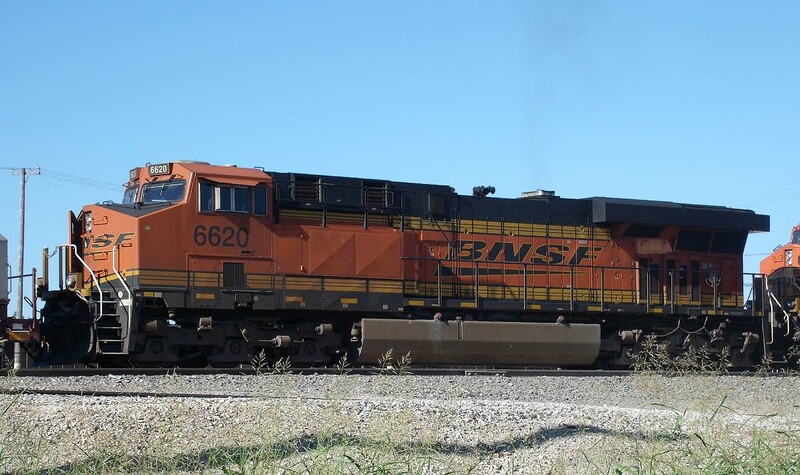 6620 trails on a freight rolling eastbound through Springfield, MO on 9/03/2013. 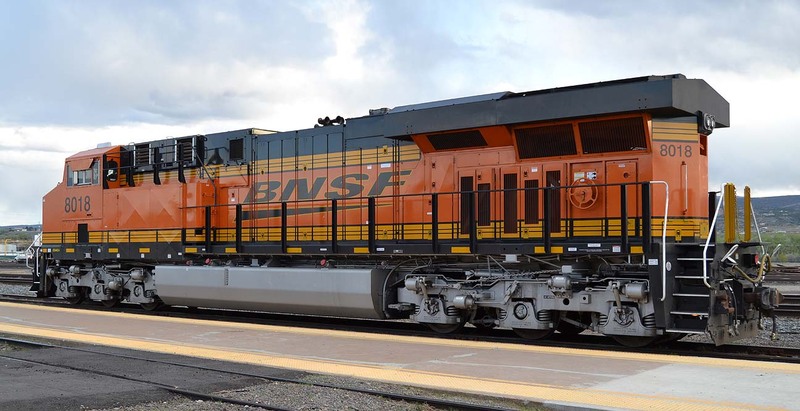 The C4 series of AC-traction locomotives is a hi-tech, A1A-A1A design with many enhanced features. 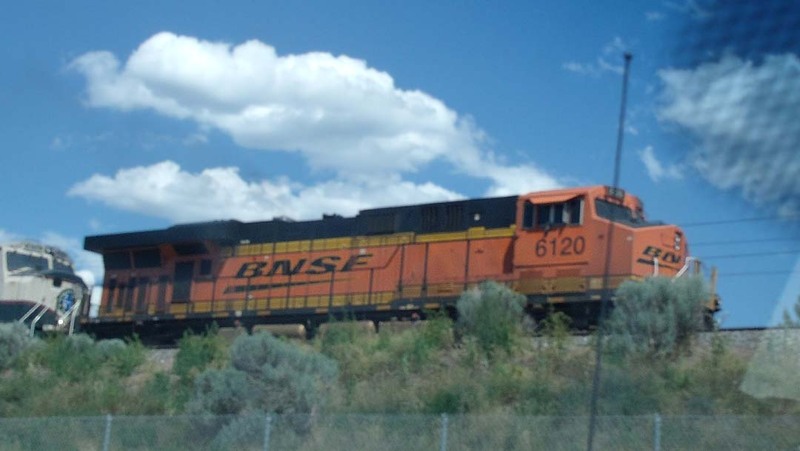 To date BNSF is the only customer. Delivered March 2009. No. 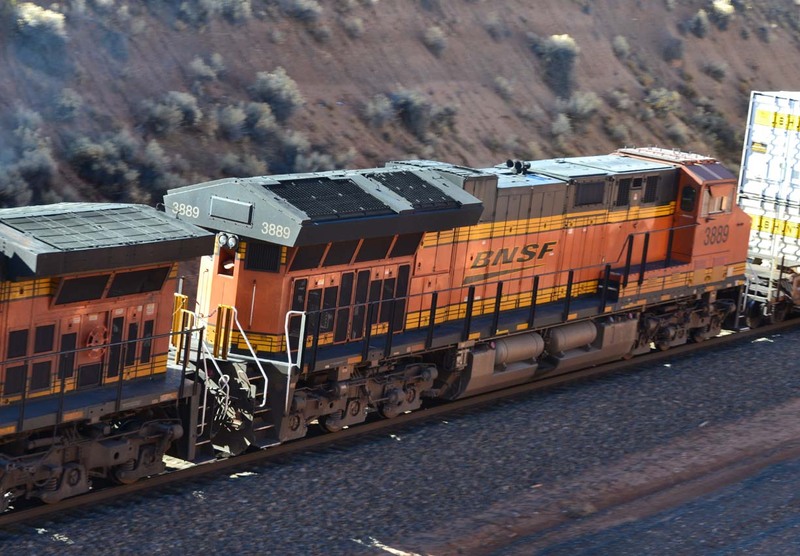 6688, an ES44C4, westbound out of Gallup on 9/24/2011. No. 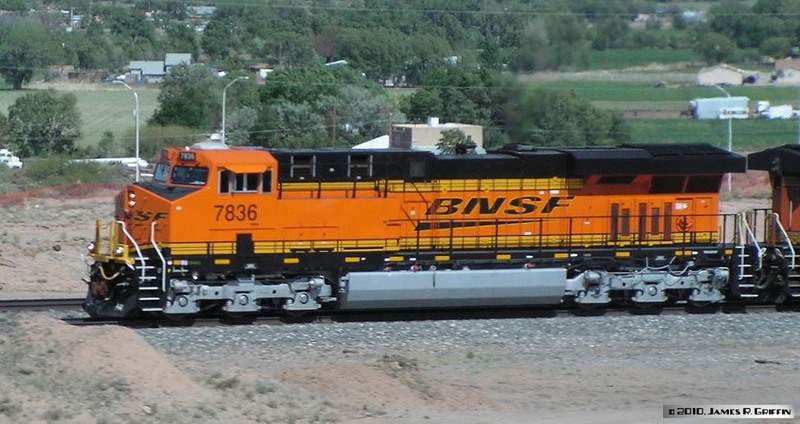 6974, waiting on the SWRR interchange at Rincon, NM. Resplendent and shiny, ES44C4 No. 8016 is only 3 months old in this perfect roster shot. In Grand Junction on 4/27/2014. ES44C4 No. 8018 is also 3 months old in this photo. 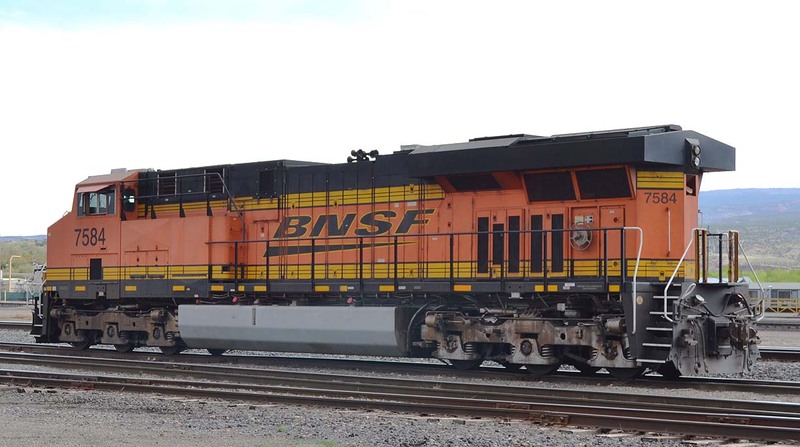 She and sister 8016 were parked on adjacent tracks in Grand Junction on 4/27/2014. This view shows off the opposite side of the model. ES44C4 No. 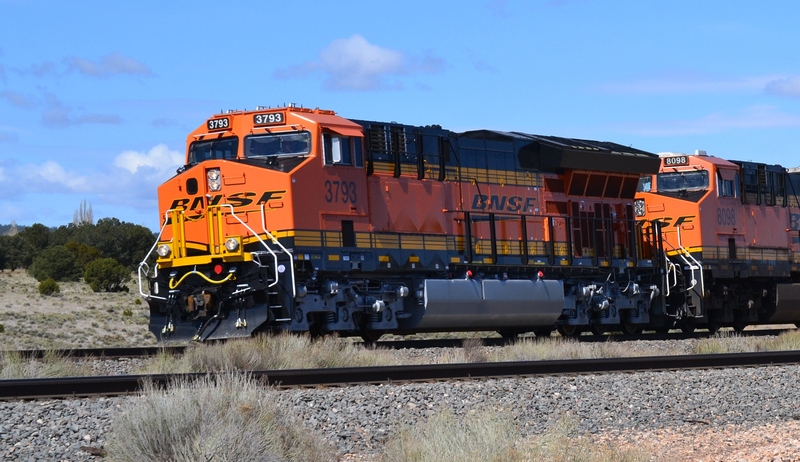 8213 is leading a westbound trackage-rights train at Westwater, Utah on 4/27/2014. Built sometime in early 2014, it’s about as new as it can get in this photo. ET44C4 No. 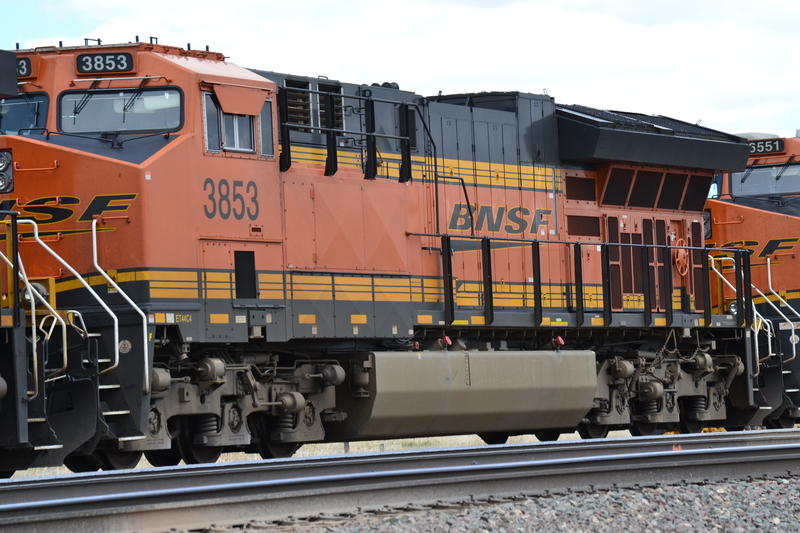 3793, coming over the continental divide on 4/27/2016. The ET (EPA tier 4-compliant) units are easily distinguished by the sharply-peaked radiators. ET44C4 No. 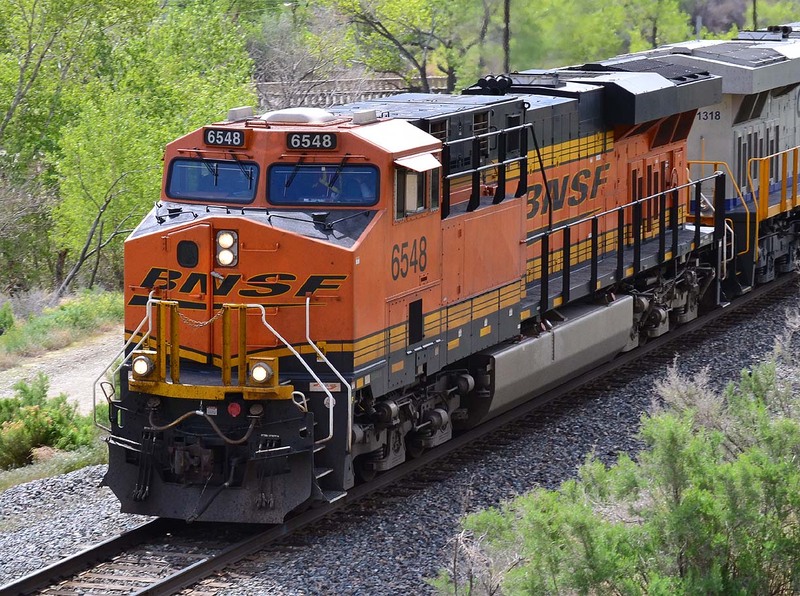 3880 is westbound on a doublestack train at the Continental Divide cut near Thoreau, NM on 4/27/2016.